Whether you’ve just started losing your hair or it’s all gone, Hair Club Woburn has proven solutions for men and women of every age with every level of hair loss. Let us customize a hair loss solution for you so you can live life to the fullest. Situated in the heart of Woburn’s four corners, Hair Club Woburn serves the hair loss needs of clients from communities all over the North Shore area, including Medford, Arlington, Lexington, Melrose, Stoneham, Wakefield, Burlington, Bedford, Lincoln, Wilmington, Lynn, Lowell, Lawrence and more. Visit Hair Club Woburn for a free hair and scalp analysis with one of our trained experts. Together, you’ll determine which of our proven solutions is right for you. Don’t wait another minute—take the next step toward experiencing life in a whole new way with hair that makes you feel confident! Visit Hair Club Woburn today and take the next step toward getting your hair back. Hair Club Woburn is located in a 2 story glass and red brick professional building in the same building as the Patriot Community Bank - they have a large sign out front. Building 237 is located on the right hand side of Lexington Street immediately after the Seaver Construction building and immediately before the Mcdemottroe gas station. Nikki joined Hair Club in 1990 and is dedicated to helping clients transform their lives through hair restoration. Her commitment to exceptional customer service earned her Hair Club’s Manager of the Year award in 2016. Karen helps determine a client’s level of hair loss and which solution is right for their needs. She joined Hair Club in 1995 and won Employee of the Year in 2002. Karen is truly passionate about providing the ultimate client experience. I've been with Woburn Hair Club for just about 9 months now and always thought about doing looking into getting help with my hair loss roughly 5yrs ago but, never was serious or followed up on it - just thought it Then I finally decided to make the call and visit the center for my hair loss assessment where I decided to go for it. I was absolutely frightened and even almost backed out. I worried about what co-workers, family and friends would say about me and how everything would look once it was done. On June 29, 2018, I had my hair solution in place and I was amazed. I absolutely loved how I looked, couldn't believe how incredibly natural it looked and thought that no one I didn't know could tell what I had done it looked so great! However, I was still petrified to see those that I knew as my hair was pretty significant on the top of my head. As I got to seeing more and more of the people I know at work and home life no one said anything to point things out or question it directly; most never mentioned it. I'm in my late 40s and it hit me that these people weren't to embarrass or make fun of me as these are people who know, like and love me. In fact, I even got some compliments like "I like your new hair cut" or something like "something looks different about you" and would reply with "it's my beard" ( as I never wore one), or I would say "I've got a good tan going from all the days at the beach" and I happen to have had lost a significant amount of weight and would say "it's all the weight I lost" (over 70lbs) regardless though I'd go home and look in the mirror and thought I looked great, that I looked younger and that I couldn't tell that I had anything done so no one else who didn't know me would either! My original solution a first few visits were with Julie however, I've almost exclusively seen Tayajana (had one visit w/Jenna and two w/Ashley). Every single one of these ladies are true professionals, they know what they're doing and they all do it very well. They've all help me in various areas related to my journey like when I asked them "What do I say when someone asks me about my hair?" or honestly when I asked them "does my hair style look good?". I offered help with styling, products and usage, maintenance, tips &amp; tricks and even when I wanted less gray the next solution was adjusted as I wanted. I feel so confident and love my look now as my now full head of hair provided that last big missing change in my transformation. I've lost 129lbs (I weighed 311 in August 2017), have a new stylish wardrobe, had a great tan over the Summer and grew in very short haired beard and have develop nice upper body muscles since I started weight training 4 months ago however, my hair solution was the crown piece that completed me. Every month I can't wait to go in and see Tayajana about my as she is very attentive to me, cares about and addresses and questions, concerns, needs and desires I have and I never leave the office disappointed or unsatisfied. She truly takes pride in not only how you look but, how you feel about the way you look. Tayajana is fabulous! I would recommend her to anyone as she easily gets a 5-star rating from me. I have been a client at the Woburn Hair Club for over 10 years. There are some things that one never forgets. When my mother passed away there was a section of her hair that was removed and needed to be replaced. I only mentioned it and suddenly I was called into the office and asked if there was anything they could. I explained my situation. The Woburn Office went above and beyond that day. something that I will never forget. It just goes to prove my point when I say, "Here you are not just a client, but, a member of a very large caring family." I have been working with Dee for most of my time as a member and can only say thank you to her for the suggestions she has made to make sure I look my best and to her caring and concern not only for me but all her clients. A huge THANK YOU to all at the Woburn Hair Club. I have been a client for over 25 years and have been very pleased with my overall experience. The service, attention to detail, ease of appointment scheduling is appreciated. I have worked with Dee for most of my time at Hair Club and her service, skills and concern for me as a client are very much appreciated!!! I would rate the staff in Woburn and in particular my stylist Dee five stars out of five. I have been a client for over 30 years and have not regretted it one day. If you are thinking about it don't hesitate. you will feel much better about yourself and be very glad you did. I’m a HC client for many years, has been with a few different outfits, and like the Woburn outfit the best. It is run entirely by a group of very intelligent, capable and hardworking women, and is a very well oiled machine under the helm of Nikki, whose infectious hearty laughter will make even Michelangelo's David smile! Nikki would talk to any customers and her staff members, listen and understand their concerns and resolve these quickly and satisfactorily. I’ve observed that, under her wise and strong leadership and insistence, each staff member treats customers with utmost professionalism and courtesy. My longtime stylist Julie is a warm hearted, very smart, wonderful and lovely human being, with a wicked sense of humour! Julie is a very experienced professional, with great knowledge of HC tools and technologies she can utilize. With customers' best interest in mind, she takes very good care of us by providing best services, makes us more naturally beautiful – in her creative ways. She tries her best to make customers feel comfortable as if at home, especially with new customers who often feel awkward in their first visits; her professional knowledge, that million dollar smile and friendly easy going manner melt away all the anxieties and awkwardness, like a snow pile under the sunshine. I have been with Hair Club for over 6 years now and have enjoyed having Rachel as my stylist for almost as long. She has been great and takes the time to make sure the hair is perfect every time. Hair Club is such a wonderful place I'm so happy that I chose to go there and I want to thank everyone at Hair Club for allowing me to become a member. A special thanks to Erica Hitt for making it affordable for me. I'm looking forward to my new look. I have been Hair Club for Men (HCM) customer for over 9 years now and have been enrolled in the Gold program. HCM gave me the same young looks that I always longed for and infused a new confidence in my personality. I must say, Hair Club for Woburn is the best center in MA. I have been to other centers but Woburn has the best service - the front desk staff is so friendly, waiting area and styling rooms are private, top notch and the hair stylists are highly experienced and long term Hair Club employees. I would like to give special thanks to center managers - Nikki, Karen and my stylists Dee and Julie for providing excellent service all these years. I see Julie Stewart every three weeks, can't say enough about her exellent service, simply top class and so pleasant to deal with. F.S. I am submitting this missive as I am enjoying a week's worth of vacation in the sun, sand, &amp; heat. And yet, I have not a concern in the world about my appearance because my stylist is the fabulous Lady Dee - Dee Stewart at the Woburn office where the entire staff is professional and cordial. I have been seeing Dee for years now and can attest to her incomparable skill and expertise. She is part artist and part scientist, and completely attendant to the needs and concerns of her clients. Over the years, she has become not just a stylish but a close and dear friend who is eager to provide A warm smile and a kind comment whenever I see her. She is a consummate professional and a wonderful human being. Dee and Maura are excellent stylists. They are always on time and professional. I also enjoy our conversations together. It is easy to see that they have a great deal of experience as they are highly adept at their craft. Friendly and highly skilled,.. an excellent combination. I have been a client for 25 years and have been going to the Woburn office since it opened. Dee has been my stylist for most of the 25 years and she is incredible. The entire staff is great. 5 stars to the staff of the Woburn office. I have been with Dee for 15 years and have loved every minute in her chair. Everyone is so friendly and professional from the moment you walk thru the door till you check out. Hair Club has been so kind as our son goes through a difficult time. Betty, in particular, has been very comforting and reassuring throughout the process. Her professionalism and kindness was so reassuring. 5 stars to the staff at the Woburn office. Woburn hasn't always been the closest or most convenient center for me, but the exceptional care and service has made it my center of choice. Hats off to Dee for putting up with me for more than 15 years. I know it hasn't always been easy for either of us. You are the best. Ed M.
The stylists are freindly and professional and make your appointment time pleasant. My Stylist, Dee, I consider a friend as well as someone who does my hair exactly the way I like it. Mike i have been a client since 1987 i am very happy with the service and the girls i work and associate with over the years Dee Maura Karen Sophia Karen and Laura they have all been so good to me and are very nice girls. All I can say is, if you want a radical life-changing experience, and you have lost or are losing hair, make the call to HCMW of Woburn... it is one of the most important calls I have ever made and it will be for you as well; my confidence and self- esteem have been restored. I have been a client for many years and am still always receiving compliments on my great looking head of hair...it truly is virtually undetectable to the eye...what a transformation! Many thanks to Nikki, a truly extraordinary manager, to Karen, head of sales who is always flexible and available for all clients, to my current technician/stylist, Julie, who has incredible talent, patience and personality-plus and also to Laura, Joan and Andrea at the front desk who always have a ready smile and treat every single client with respect, dignity and total professionalism. All of you get my vote, hands down. Again, sincere thanks for always being there for me...it means everything...you all make a huge difference! I absolutely love my hair club AND my personal hair stylist, Dee. She is the BEST! Everyone treats me like family. My hair has never looked so good. THANKS! I have been to three other "companies" over the past 22 years they all claimed to be the best. They were wrong.HCMW specifically Woburn is far and away the best I have done business with. I have worked with just about all the stylists and everyone of them have been professional and talented. Laura,Andrea and Joan great job at the desk. Nikki Karen and Gino thanks. I'm not always the easiest customer. Sophia and Connie are the two stylists I deal with the most. Sophia always smiling and makes sure I'm happy before leaving. Connie...not enough space here. Let's just say you're usually right and you are the BEST. Angel is the bestest in the whole world! Laura is the best Admin Asst also!! I love them all! I've been a long time client of HCM and a very satisfied customer. The entire staff at the Woburn center is outstanding. The receptionist Laura always greets you with a smile and is more than willing to help out with any issues you may have. My stylist Dee is extremely talented at what she does. She's always been willing to go the "extra mile" without hesitation. What I feel sets her apart though is her caring nature, sincerity, and great sense of humor. One client wrote, "he feels like a member of her family". I couldn't agree more. I've feel very fortunate to have been with her for over twenty years. HCM is very lucky to have her. She's the best! I have been an EXT, Extreme Hair Therapy, client for 3 years in the Woburn office. Every one here has treated me with respect, confidentiality and have become close friends. Julie, my hair specialist, is extremely professional, does her job with the most interest and compassion to the ultimate goal of achieving my hair growth. As cautious as I was, to make the investment in Hair Club, I'm extremely happy with the results and that I had Julie as my specialist throughout my process. As a final thought, I have and continue to see growth along with people noticing my hair filling in. Thank you to all office personnal especially Julie for an exceptional experience. As being a Hair Club member for over 25 years, in the Woburn, MA office.. I would like to recognize, commend, and highly recommend stylist ELIZABETH TOTO! Her professionalism, expertise, positive attitude, and styling experience is a true attribute, asset, and highly positive addition to the "Hair Club Stylist Family:!...For that, she should be awarded/acknowledged!! She is always professional, focused, flexible, and provides 100% customer satisfaction all of the time and every time! She knows how to listen to her customers, and work with them positively with always a smile! I'm so glad I've found HCMW of Woburn. The staff there are very friendly. Joan and Laura at the reception desk and my 2 stylists Julie and Jenna always greet me with a smile. Julie and Jenna have been doing a fantastic job for me, which is why I've been going to HCMW Woburn for nearly three years now and will continue to go. Thanks to them I look younger and my confidence has increased ten fold! Also, thanks to Gino and Karen for their professional consultation - would've never jumped on board if it weren't for them! Highly recommend HCMW of Woburn. I have known the people at hair club for about 7 years now, they are the kindess careing people, they truly helped me in a difficult time. all the ladies that wash my hair, all the way to the ladies that set up my appointments, and take the time to talk to me, also Gino who is so nice. I have nothing but great things to say about all of them, and I am so pleased for all that they do for me. Thank you hair club, you have been so helpful over these past 7 years! I have been a member for about 10 years and have always feel comfortable when I come in. Dee is my regular stylist and does a great job every time. But even when I can't get get an appointment with Dee all the other stylist do a great job too. The receptionists are nice and friendly. I have been a hair club client for 25 years and have never regretted joining. Dee Stewart has been my stylist most of that time and she is as good as it gets.Truly outstanding. Everyone makes you feel at ease. Maryellen and Joan especially make me comfortable. The confidentially is comforting. I have been going to the Woburn office for over 10 years. I can not praise the whole staff enough from the front staff to all the stylists I have worked with over the years. They are all great but Dee, my regular stylist is unbelievable! She is like a member of my family. She treats me like royalty! I've been very pleased with my experience at HCMW. After 6 months, I have already begun to see positive results. Karen and Joan are extremely accomodating and friendly. Julie S. does a great job with styling and color. She is incredibly up beat and makes each session more than enjoyable. Thanks to all of you. I love going from Winthrop,next to Boston, To Woburn office Because every one treats you like family.I love all the staff!!!!! 5 star rating for Betty! I receive many compliments on my hair and it is all because of the wonderful job that Betty does. She is extremely skilled and professional. Betty has made me look 10 years younger! I highly recommend her! I've been a member for a year. The ladies at the Woburn Hair Club are the best! They are the most caring, pleasant and professional. I feel so welcome each time I go there. I highly recommend the Woburn Hair Club if you have thinning or hair loss. I have been a member for over 17 years. I have worked with different stylists during that time. While I have always been pleased with the service and results, one stylist has definitely been the best of the best. Her name is Connie Mamakos. If you are looking to join, or change the center you go to, I could not recommend her enough. I've been a member for 3 years. Cannot say enough good things about the Hair Club. They go out of their way to please and accommodate me. True professionals. I have been a member for 20 years and have experienced many levels of talent and I can say that Dee is the best, she is professional, considerate, knowledgable and represents HCM at the highest level. All of the Woburn personnel are skilled but non better that Dee. I have been going there for 2 plus yrs and have had a great experience, my favorite stylist is Connie,my wife likes how she cuts my hair too.Laura,Andrea,and Joan at the reception desk are very helpful and always remind me of my next appointments. I have been a client for the a little over 13 years and am extremely pleased and satisfied with the service rendered at the Woburn office. The staff are all courteous and very accommodating and greet you with a smile! Dee is my primary stylist and go to Connie hen she is not available. I look forward to my appointments as both are a "laugh a minute"!! I could not be happier with the sense of urgency and care that goes into my services. If we can mention by name, Betty is my absolute "go to" stylist and Dee is always there in the bull pen to be my consistent back up......I actually enjoy going in when it is time for them to work their magic! I've been a client of HCM for over 3 years at the Woburn Office. The staff there a great and genuinly care about your wants and needs. Betty has been my stylist and is one of the best, her knowledge is above expectations. She has change my life and I thank her for that. This is from the bottom of my heart. Love being a part of the HCM family of Woburn. 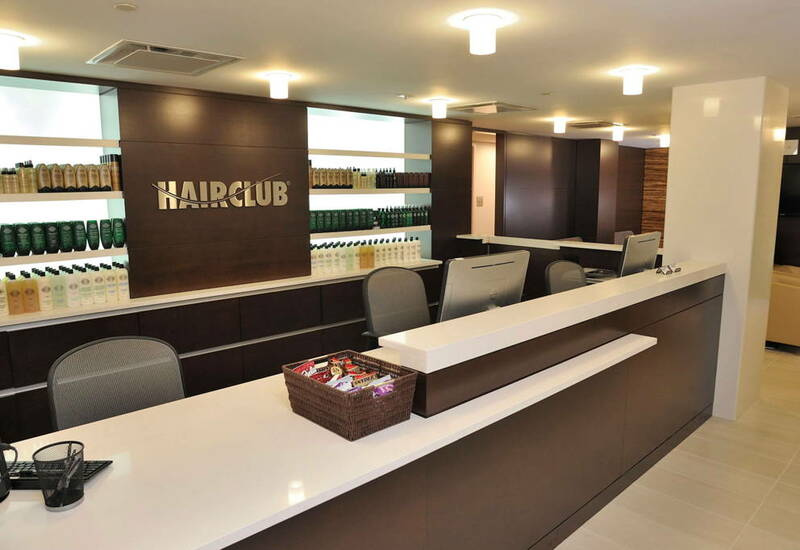 I've been going to Hair Club for women in the Woburn MA office since 2011, for almost 3 years. I am glad that i did went there for help. At first i was not sure if it was going to work, but 2 years later i am glad that i did gave my self a chance to try there products. I have been blessed that i have a wonderful staff, that are so warm welcome us like family members.I like to thank you to someone very special that always take care of me shes! so sweet. Julie thank you so much for everything you do for us. You are amazing so warm &amp; always welcome me with a smile &amp; offer if i want a cup of tea or coffee. Well you are so nice to the costumers. God bless you for all you do to make us fell comfortable &amp; special. Thanks also to the rest of the staff you are all wonderful. Keep up your good work. I highly recommend others for this hair loss Club @ Woburn MA. I have had nothing but the best service, care, responsiveness, and attention with the Woburn team. All work together in taking care of the customer. Dee, Laura, and Joan have brought their A game everyday to work. If I need a special request they go out of their way to resolve it. I strongly recommend the Woburn service center. I have been serviced by the Woburn team for over 18 years and I can not think of one bad experience. I have been coming to the Woburn Center of Hair Club for years and have been thoroughly satisfied with the level of service I have been getting. My wonderful awesome stylist Maryellen Correnti has been a life saver many times over for me. The staff of Joan, Laura and everyone there have been so nice and helpful to me at all times. Karen and Nikki are always there to speak with me and help me. I have had stylists before but none compare to the ones at Hair Club in Woburn. Thank you Betty, Angel and everyone that has done such a lovely job in the past on my system. Loving the HCFW!! I have been a Hairclub member for over twenty years and have had many stylists but none better than Dee Stewart. Not only has she been professional, consciencious and accommodating, she has been an excellent representative for the Hairclub for Men. Hair loss can be very tramatic but Dee has taken a negative and made it a positive. Although I have rightfully singled Dee out, I would like to commend the entire Woburn staff. I ENJOY GOING THERE DUE TO THE STAFF MEMBERS ARE EXCELLENT ALONG WITH SUPERB CUSTOMER SERVICE. I ESPECIALLY LIKE MY STYLIST WHICH IS ANGEL SHE IS VERY KIND, EXCEPTIONALLY HIGHLY - SKILLED IN HER WORK. SHE ALWAYS MAKE LOOK GREAT AND I AM ABLE TO CREATE NEW STYLES EVERY TIME I WASH MY HAIR. I EXTREMELY GREATFUL THAT SR CONSULTANT KAREN AND THE MANAGER NIKKI ALLOWED TO RETURN TO THE SALON. THEY ARE SO UNDERSTANDING AND PATIENCE WITH ME. I JUST WANT TO SAY A GREAT BIG THANK YOU TO THE ENTIRE TEAM MEMBERS WHO TAKES PRIDE IN THEIR WORK AND ALWAYS STRIDE TO BE THE BEST. Hard to believe but I have been a client since 1985 starting in Boston, and still feel it was one of the best decision I ever made. In my 28 years, I have had very few issues, and any issues that I did have were always addressed quickly and professionally. Although all the stylist have been great, I have worked mainly with Dee since the beginning and not only has she been exceptional and amazingly quick, but has a great sense of humor that makes the visits fun! Dee and I have grown up together and become good friends over the last 25 plus years. Thanks Dee, and you can not retire for at least another 25 years and I promise I will try to show up on time! i have been a HCM member for 22 years i have been to Boston, Manchester and Woburn, i prefer the Woburn office because of the staff there, they are always accomadating and provide great service Sophia is for sure the most consisitent stylist i have ever worked with her work ethic and reliability is always perfect, all the girls there are always nice especially Niki and Joanie im a very picky client and my expectations are always high they always deliver. The Woburn office has a great staff. I followed Angel from center to center and I always will. She is more like family than my hair stylist. I am so pleased with my hair and appearance. How the girls have transformed me is incredible. I want to thank Angel for all her expertise and her qualities for making me feel special. I also want to thank Betty for all that she done for me. The staff is just great. They make you feel special whenever you walk into the facility. Nicki a special thank you for your help. My stylist is Julie S. If you had a ten star rating that's what she'd get. She's awesome. Always on her game every time. She always makes me feel so comfortable and I actually look forward to going. She is a great stylist. I would also like to give a shoutout to the girls at the reception desk. They are always friendly and awesome to talk to. Keep up the good work girls! You are tremendously appreciated. I can't say enough good things about the HCMW Center in Woburn. The staff is friendly and truly has knowledge about hair loss and restoration. I have been a member for almost 5 months and the results have been impressive. It was an investment well worth it, the results say it all. I have been very pleased with the staff and services at HCM/W. They have always been able to accommodate my scheduling needs. The products are wonderful and my hair has shown improvements. Julie has been my hairdresser and she does a fabulous job with both my cuts and coloring. She listens to my needs and concerns and always complies to my wishes. She is very cheerful, kind and most talented. I've always been pleased with her work and highly recommend her!!! Have been going to HC for several years now, am totally happy with my experience there, the staff is just awesome, so caring, friendly yet professional, no matter who I've dealt with. Karen and Nikki have been truly great in management, always there to advise or help. MaryEllen is the best stylist for me although there's been others like Angel. MaryEllen has always taken such care to make me happy which is soo important to me. So thumbs up to the Woburn Center, please never leave!! I have been a client for 18 years. For most of that time my primary stylist has been Connie M. She has been consistently excellent. On the few occasions that I had issues with my system, she has responded creatively and constructively. Very satisfied customer. I’ve been a member for 10 years and I’m very pleased with the job everyone does. Great team! All of the people are professional in speech and manner but Angel is without question the most skilled professional with a great attitude! She makes the visit a pleasure! Great job by Angel and everyonethere. Should have gone years ago! I have been a client for 5yrs. From my 1st experience walking in to my last appt., the staff and my stylist MaryEllen are warm and friendly. MaryEllen is a wonderful stylist, always goes the extra mile to make you look and feel great! I would highly recommend the HCM/HCW to anyone seeking to take control of their hair loss. Great location, easy to get to and plenty of parking. I have worked with most of the staff and they are very professional and friendly. Currently working with Sophie who is absolutely delightful and always listens to any concerns I may have. The front desk personnel and always cheerful and extremely accommodating. Thank you Hair Club. I have been a client for 19 years and the staff ar all great. Laura &amp; Karen do a great job. Maura does a great job styling and always goes out of her way for her clients always with a smile too. I'm extremely satisfied with hairclub.terrific from desk staff and I love the stylists!!!! I’ve been a client for about seven years, The people and service have been great! While my regular stylist Dee was on vacation I needed to see someone right away. Joan the receptionist had me come in and helped me get an a service. Betty Toto helped me out right away (On her lunch break yet!) I feel very good with these people, you’re not just a client with them, you’re a friend! Great service. All the ladies do a fantastic job. Great team that takes great care of me. Terrific front desk staff and love my stylists including Angel, Connie and Mary Elllen. The product is terrific and very comfortable. The team is professional and very knowledgeable. So glad to be a client. To whom it may concern, I have been an HCM client since 1985 and always satisfied with the product. I will add that the experience was greatly enhanced, once the Woburn office opened 11 years ago. Karen and Nicky do a fabulous job of managing a great staff of professionals. It is very well organized and always a comfortable surrounding. Appointments are punctual and they are very flexible in accommodating unexpected changes. I especially would like to single out my technician, Angel. She not only is a great hairdresser, but she cares enough to always give me an honest opinion about what would look best on me. After all, when I leave HCM, I want to feel good about the experience and myself. That is what this office does for me. Tony V.
HCM of Woburn is fantastic!! I have been a client for two years and have enjoyed every minute. The staff is the most customer centric group I have ever been associated with. They go above and beyond to exceed expectations. You are part of the family the moment you walk through the door. I look forward to my weekly appointments with Mary Ellen. Not only is Mary Ellen an incredible stylist but is also warm, thoughtful, caring and has changed my life more than she knows. It is a pleasure and honor to be part of the HCM of Woburn family. I have been a client for 6 years. The personal attention is amazing. MaryEllen C. is so patient and detail oriented. The entire staff is great. Karen D. makes every customer feel like they are the only one. I love MaryEllen and Betty. MaryEllenb has even given up her lunch breaks to squeeze me in if i have a special occasion.She spends so much extra time satisfying my every need. I am a very difficult demanding client. There is a personal feeling about the office,I have found that thuis makes for a rewarding experience. MaryEllen listens to your needs and is understanding.Hair Club is not your typical glue and wig factory,it is so personal accomadating. I have been going to the Woburn Branch of HCM/HCW for the past 6 years. The staff are always very courteous and professional and make each visit a positive experience. Andrea, Laura and Joan at the front desk never fail to greet me by name with a smile and cheerfully attend to whatever needs I have. The stylists are also very positive and routinely engage me in pleasant conversation while going about the business of giving me the best possible hair treatment they can. Betty (my regular stylist) is so good at this that I often forget the passage of time and before I know it she has finished and given me a wonderful head of hair. I have always come away from a visit to this center feeling very satisfied, and I expect this will continue for many more years to come. Thank you all for the awesome service you give me! I have been a client for about 25 years. The staff at the Woburn office is excellent. A special shout out to Nancy. I've been a member for 16 years. I've been to several offices over the years. They are all professional and competent. Now, I'm sticking with Woburn. They are fast and efficient and get me on my way. I have been going to HCM for the past 17 years and have had very pleasant experience. I have enjoyed working with nikki and angel for several of those years. . I have been wearing for 43yrs &amp; I have been with HCFM about 7yrs. They are far &amp; away the best system I have found.And GREAT service . I have been a HC member for nearly 20 years, associated with several franchises at different times. I hold very high opinion on the Woburn, MA, staff, from technicians up to manager Nicky. They are highly skilled professionals, always very courteous, respectful and friendly, and are excellent in going an extra mile to meet members' (sometimes changing) needs. I highly commend their work, services and high work spirit. It is a great joy to go there each time! Nicky is outstanding as a manager,Angel goes out of her way to satisfy a clients needs.Sophia is very good also. I enjoy all the ladies that I have had for service. I would recommend this location to a friend. I am very happy with the service and care at the Woburn office. The people are very friendly. I definitely made the right choice coming here. Angel is my favorite! I been hairclub for 8 month.I love the people in the woburn office but Julie is the best there. She is the great person and take care my hair. You are the best juile. I don't mean to sound like a commercial, but my only regret is that I didn't do this YEARS ago!! I am so happy with the product, the service, and most of all having hair that I love and I am not embarassed about! Don't wait. You will be glad you didn't! I love the Hair Club for Men/women. All of the staff is so caring and genuinly interested in your happiness. If there is ever a problem they are right on it and strive to make you happy. The Woburn office is wonderful. I especially enjoy the fact that you don't have to pay for parking. The staff of Karen, Laura, Janique, Gina, Maryellen, Sophia, Nikki, (sorry if I left anyone out) You are ALL fabulous people, professionally and personally. This was the best thing I ever did for myself thanks to the HCFM/W.